We often hear that renewable energy is “not there yet” as a viable source. The oil & gas industry touts their “job creation numbers” as a reason for boosting the economy. But is this really true? Do we shove wind and solar to the back of the closet? Not only did the renewable energy sector create over 110,000 US jobs in 2012, there are thousands of renewable energy projects going on in the United States and across the globe. Public transportation drove clean job growth nationwide, clocking in at over 43,000 jobs over the course of the year. Power generation, most of which came from solar, wind, and geothermal, came in second with more than 30,000 jobs. Solar power was a strong and steady job creator throughout the year, and especially in the fourth quarter, providing over 19,000 jobs between the manufacturing and power generation sectors. Investment in energy efficiency hit a record high of $5.6 billion in 2012, according to E2′s analysis of government data, thanks to the announcement of as many as 9,000 new jobs. Europe, Asia and even OPEC countries are getting themselves off the fossil fuel habit, and moving ahead with solar and wind. The United Arab Emirates (UAE) has over $5-billion invested in renewable projects. One of the UAE’s motivating factor is the diminishing supply of fossil fuels, by converting to renewable sources for their country there will be more fossil fuels to export to short-sighted countries. WHERE DOES THE US RANK? 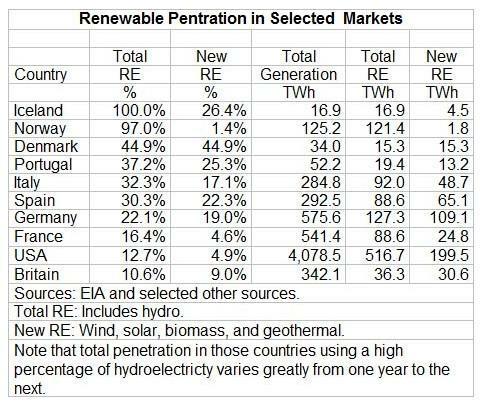 From Renewable Energy world.com: Breakdown: Penetration of Renewable Energy in Selected Markets, the US is producing as much in total renewables in 2011 as we did in 1983. We barely reached the 14% mark in 30 years. 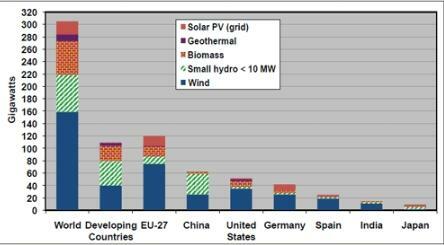 Compare that to other countries which are utilizing well over 50% renewables for an energy source. The US ranks 9th out of 10 countries surveyed. Worldwide comparison, the US lags behind developing countries, European Union (as a whole) and China. We use to be NUMBER 1 in technology and innovation, with the rest of the world clamoring at our door. Why aren’t we number 1 with renewables? Clearly, countries can, when they choose to do so, generate a very high percentage — if not 100 percent — of their electricity with renewables. The challenge has never been technical. The problem is the lack of political will to make the choice and consistently implement policies that work. 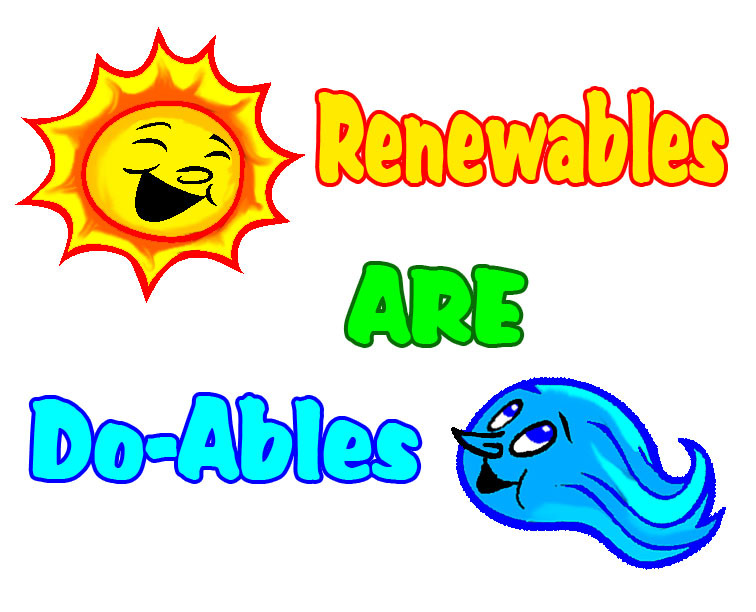 We can be NUMBER 1 in renewables, it is do-able, but we have to make that choice. What do you choose? Tags: coal, doable, energy efficiency, fossil fuel, geothermal, natural gas, oil, renewable, Solar, wind | Permalink. The “lack of political will” is exactly the conclusion of Jacobson and Delucchi in their Nov. 2009 article in Scientific American. We have the science, engineering, raw material sources and energy resources to power the planet without fossil or nuclear energy. The fossil fuel, nuclear power and centralized electric utilities are threatened by the loss of profits, power and control over the energy creation and distribution. They only think of the short term profit and loss, their bonuses and stock options, not the environment and the quality of life. Sustainability, climate and weather disruption by continued green house gas emissions are not a concern of theirs, only the maximization of profit and power. How much profit is enough? We need a “check and balance” on corporate power on government at all levels, from the Federal, State and municipal level.